"Camp followers", or sometimes erroneously known as "distaff", were women who played a vitally important role in the life of a British army regiment. These women were "on the strength", meaning they were recognized by the regiment as having a legitimate purpose and issued rations accordingly. Women had hard lives with the army, receiving 1/2 rations (children received 1/4) and they had to share their husbands' accommodations and privations. As such, 35th camp women were working-class, lower-class women who lived tough lives and should look accordingly. They did not cook for the men's messes, but they could be called upon for any number of tasks by the officers, including running laundries, nursing, mending clothes, running sutleries which sold spirits to the soldiers at fixed prices, and even foraging. NOTE! Though cosmetics were available in the 18th Century, our ladies portray working campfollowers who would not have worn make-up. 35th campfollowers should remove any nail polish prior to an event. Obviously modern and anachronistic hair colors and styles must be avoided or concealed which is relatively easy to do if a woman follows the appropriate clothing guides below. The powdered hair and faces of the 18th Century upper-crust are not appropriate for our impression. Jewelry must be appropriate and kept to a minimum, considering that almost all campfollowers were impoverished women. Modern wrist-watches are not permitted. Cell phones must be hidden at all times and kept on silent (or turned off). We understand many people use their cell phones to take pictures, but efforts should be made to keep these modern invasions discreet and infrequent, especially in the presence of the public. Shift - also called a chemise, this is a linen garment, typically white, which is the basic undergarment. It extends below the knees. Petticoat - linen or wool, a woman would have a petticoat and an under-petticoat at minimum. Two petticoats are preferred. This skirt reached to the ankles and can be a solid or a period-appropriate print, check, or pattern. Remember that camp women were quite poor, so stay "modest" with fabric choices. Pocket(s) - the pockets were separate items from the rest of the clothing and were tied around the waist with a cord. The pockets are not worn on the outside, but under the petticoat. 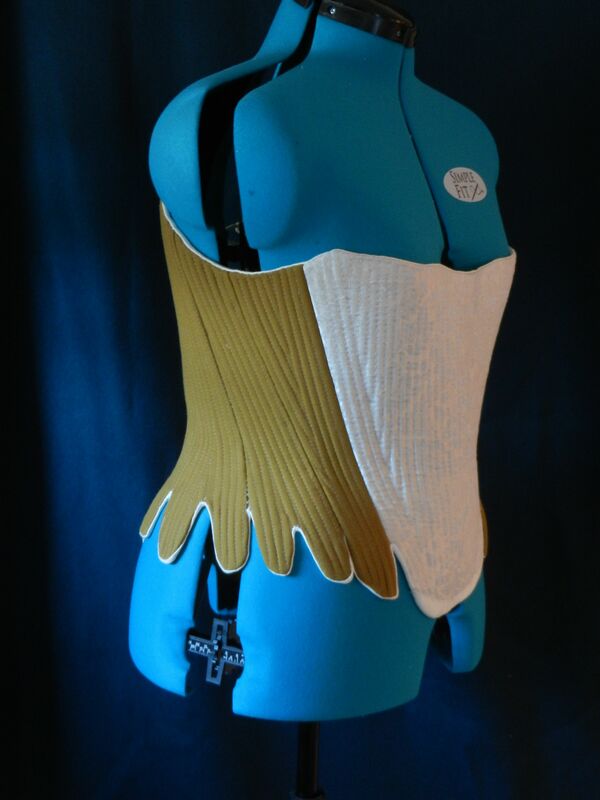 Stays [﻿pic﻿] - not a "corset" but a structured, boned undergarment which gives the woman's body a conical silhouette. A good set of stays is essential for creating the right 18th Century look and it will provide good back support while doing physical tasks. Stays are never to be worn exposed, as it would be exceptionally indecent. Shortgown - the basic woman's working garment. Linen or wool, the shortgown generally has 3/4 sleeves and is pinned shut in front. 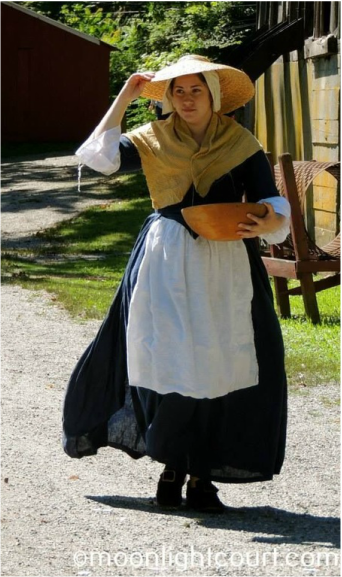 Apron - linen or osnaburg, the apron typically ties around the waist and can be pinned to the upper torso. An apron is highly recommended for working-class women. Fichu - sometimes known as a "modesty piece", this was a simple square of material folded into a rectangle, worn around the neck and tucked into the dress. Doing so protected the exposed upper chest from the sun and the gazes of others. Cap - a linen cap, generally white, was always worn. The cap would protect the hair from dust and grime, and also conceal hair which may be less than tidy in general. Hat - a low-crowned hat, whether straw or wool felt or other material, was a common accessory to keep the sun off. A large hat pin, through the cap and into the hair, then out again, would hold it in place. Shoes - while not absolutely essential, shoes and stockings are highly recommended for obvious reasons. A rough-out buckled or laced 18th Century shoe will serve you well. Avoid fancy buckles and seek simple styles or consider leather thongs for laces. Stockings may be of various natural colors, but horizontal stripes are forbidden. Camp followers did not style themselves after the Wicked Witch of the West. Basket - a woven wicker basket is an ideal way to transport things about. It is the recommendation of the Ladies Committee that new members who have sewing experience purchase a copy of Janice P. Ryan's Basic Six-Piece Clothing Wardrobe. The pattern will guide you in basic 18th Century sewing techniques and garment-construction which do differ from both 19th and 20th (and 21st) Century sewing methods. In addition to laying the framework for many 18th Century garments, the JP Ryan pattern will produce a reliable, basic wardrobe suitable for all 35th Regiment campfollowers. Flying Canoe Traders - we highly recommend this company for rough-side-out shoes. Please check their schedule and meet with them for a fitting at an event. Fugawee - we require rough-side-out shoes for campfollowers. Like the men's shoes, these will show less wear than smooth-side-out.